Stone’s Throw Garden has moved to Ethos Health. Stone’s Throw Garden is an organic garden on one acre in Lebanon Township, Hunterdon County, NJ. It was created in 2000 and is run almost single-handedly by farmer Nora Pugliese. After the birth of her second child, Nora Pugliese decided on a career change. She found it at Farmer John’s Organic Produce, a 10 acre farm in Warren, NJ. Under the close tutelage of John Canright and his son — farmers, philosophers and mentors to many of New Jersey’s current organic growers — she learned about Consumer Supported Agriculture from dirt to dinner. After a few years apprenticing at Farmer John’s, Nora and Mark with their two small boys moved out to a 5-acre house in Lebanon Township, NJ. The original fixer-upper farmhouse included a charming old stone building with lots of potential. They fenced in the old horse turnout and started breaking sod. Underneath was some great soil and hundreds of thousands of palm sized rocks. 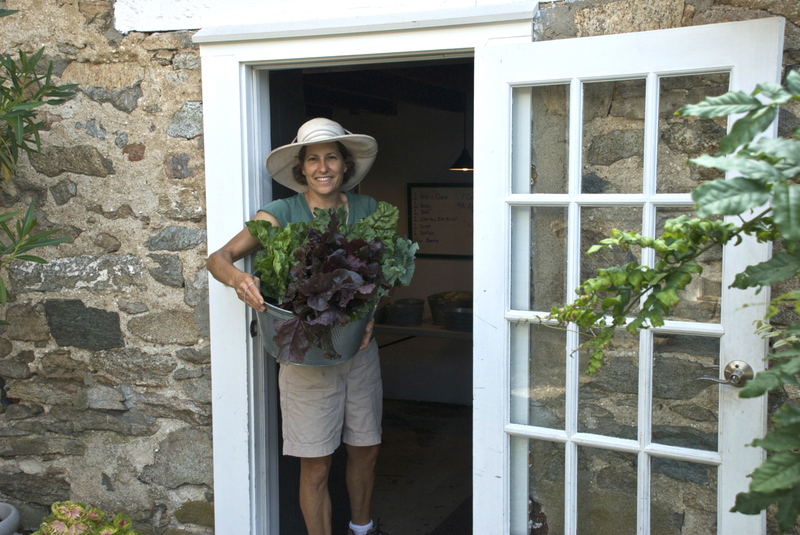 In the decade since the first CSA in 2001, Stone’s Throw Garden has grown a lot more than vegetables and flowers; it has grown a community of people interested in where their food comes from and how it tastes. In January of 2014 Nora was approached by Dr. Ron Weiss to help him launch a new enterprise in Long Valley, NJ. It is called Ethos Health and it is a 340 acre Farm with buildings as old as the American Revolution. Ethos Health will combine Farmer and Doctor side by side with food being the medicine of choice. Nora, Maya and Mark are there everyday and will probably move into the stone building called the Farmer’s House. If you know someone interested in renting our fenced in 1 acre plot in Lebanon Township, let us know! It comes with a house to live in.